we read with much curiosity the post of chuvaness about going back to glorietta weeks after the blast and finding it to be a ghost town. we were actually planning to go to glorietta the week of the blast to source for a fashion editorial, but we just couldn't find the time, and before we knew it, it was friday. then boom. and we haven't been back. so we decided to do our sourcing in mall of asia. they have all the brands there, even some that glorietta doesn't have. the only thing missing are the luxury brands. MOA is not an easy mall to navigate, though. it's just too damn huge! we wish they had giveaway maps like they do in malls abroad, like in hong kong, singapore, or the states. we got tired going around and around, looking for certain stores. yeah, we know they have a directory, but it's tiring even just looking for THAT! 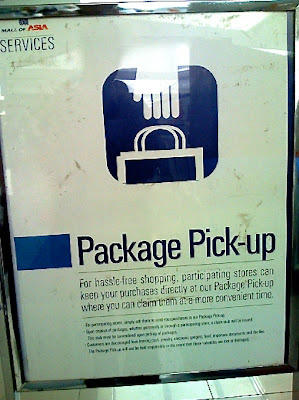 it's a good thing they have this service: so no need to carry all your purchases around. plus they have those golf carts meant for senior citizens and the physically challenged. but we saw some stores that have closed because the market just isn't there. we were surprised to see bizu closed with the tables and chairs all pushed to the side and the counters devoid of those lovely macaroons. 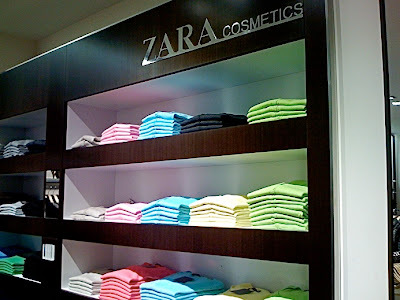 we ended up in zara and look at what we saw: does this mean SSI will finally be bringing in zara cosmetics? and hopefully zara home soon?? thanks for the tip, anon. next time, hopefully we can find that damn information desk. maybe they need a map just for that too! Right you are, sweetie. The cosmetics are coming in first... don't know when the Zara Home will come in, though. Yes, they have maps like the malls on HK. Just get it from the concierge. MOA is actually easy to navigate after your first or second visit.